Preheat oven to 350* and gather ingredients as seen below. Open Biscuits and flatten onto a greased pan. 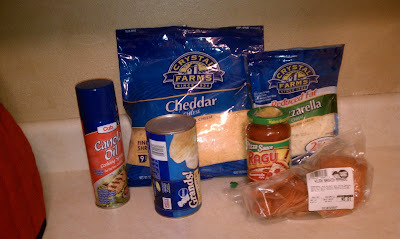 Put on your pizza ingredients. We just used pepperoni. Bake for 14-15 minutes and remove from oven. A good indicator is when the bottom is turning golden brown. Tyler loved them so I hope you do too! Short and sweet, perfect for a Friday night! YUMM!! I love love love pizza, so this is a great twist on it! Thanks for sharing, I will definetly be trying this! We made these last week too! 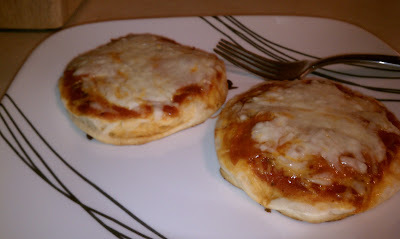 But I made them in a muffin tin b/c they were smaller biscuits- love how yummy and easy these are!